-Smoke charge modified to 60/40/1 KN/Sorbitol/RIO. Once again, the trek to the launch site was somewhat hindered by muddy conditions due to recent rains. It was necessary to stop every now and then to scrape mud off the launch wagon wheels. Once we arrived, setup proceeded smoothly with no glitches. The BRB transmitter was switched on, then on-board camera was activated. Raven flight computer confirmed all four pyro channels functionality. Backup timer was tested and confirmed to be operating nominally. For videotaping the flight, I used the hand-held camcorder (with scope tube). 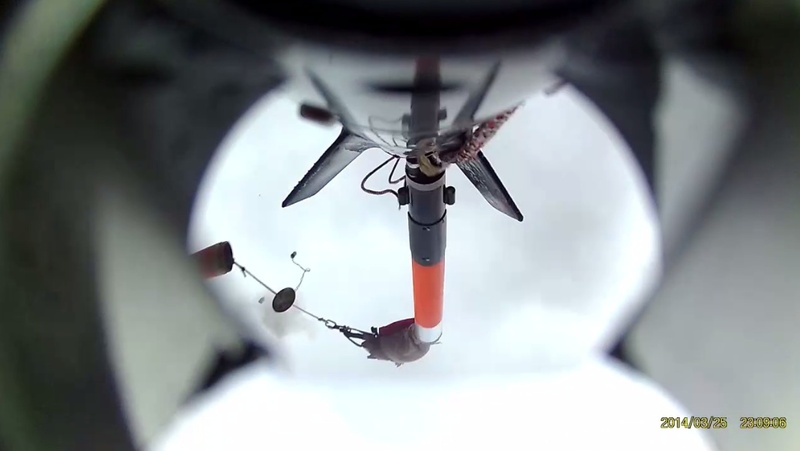 A second camera was set up on a tripod near the launch controller station. After verifying the sky was clear, the countdown proceeded. 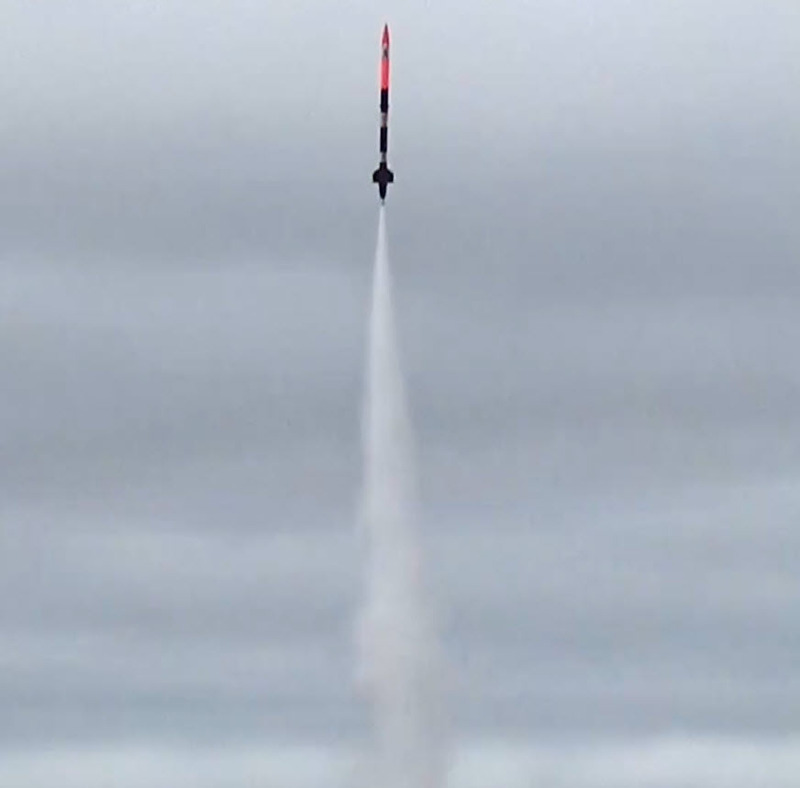 Immediately after ignition switch was closed, smoke was seen issuing from the nozzle and one second later, the rocket soared off the pad, with nice vertical climb. The motor burned for less than two seconds. The rocket quickly disappeared from sight after burnout. 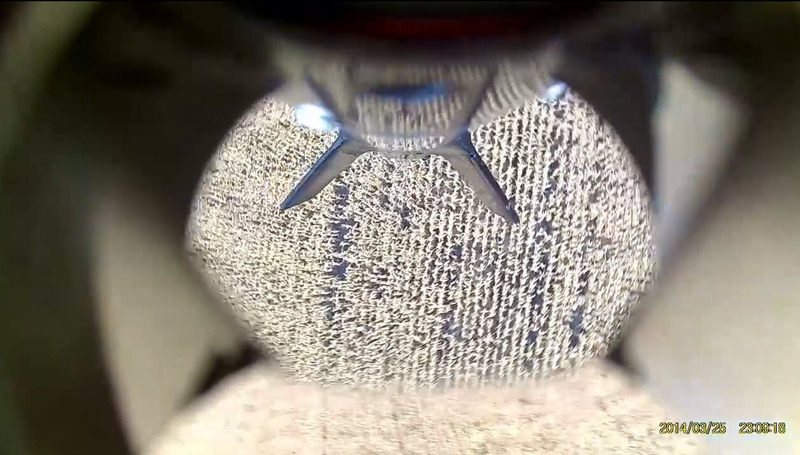 After about 20 seconds we heard the ‘pop’ of the apogee separation charge. The rocket was not sighted nor was a smoke trail seen (as expected due to the grey cloudy sky). 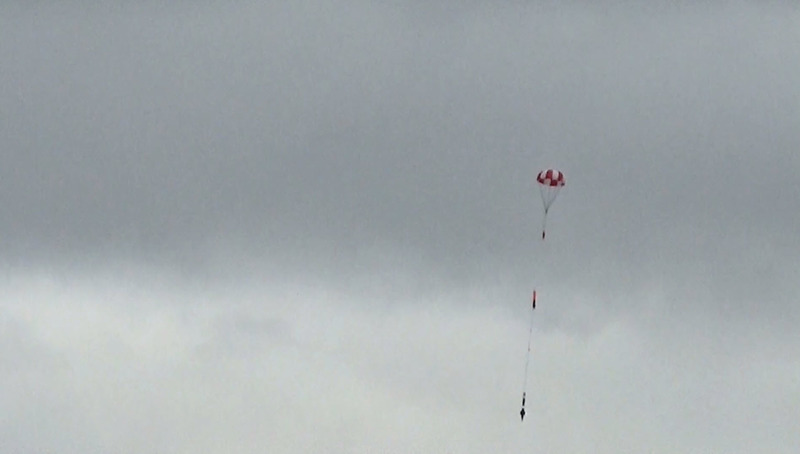 About a half minute later a ‘pop’ was heard and the rocket, under a fully blossomed parachute, was spotted about a thousand feet downwind. 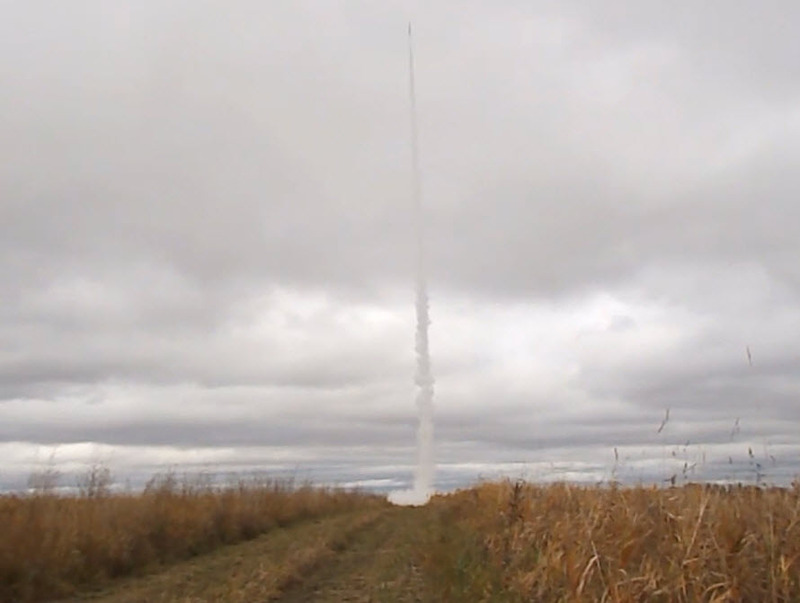 The rocket gently drifted earthward, carried downrange by the wind. Touchdown occurred about half a minute later. 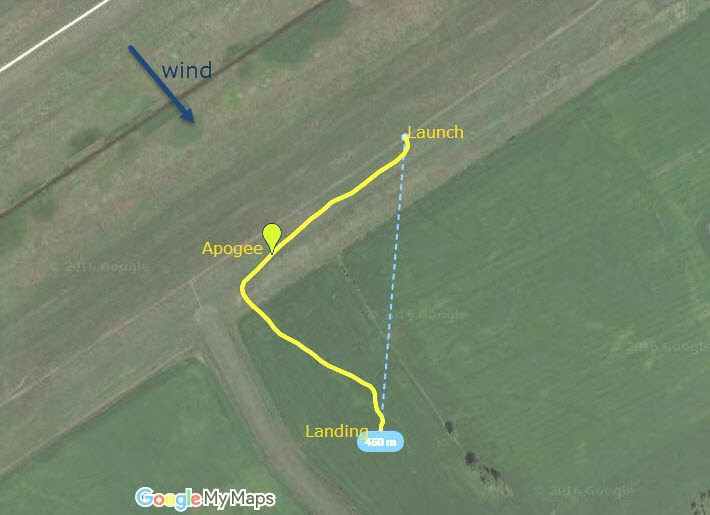 We then programmed the BRB GPS coordinates into the Garmin hand-held GPS unit, which indicated the landing site was in the middle of a cornfield, 0.28 miles (450m.) away. 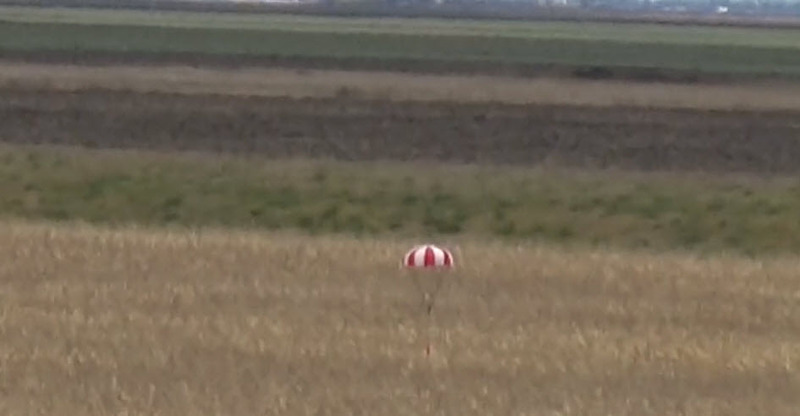 When we arrived at the touchdown site, the rocket appeared to be in perfect condition. Raven beeped out an apogee of 3511 ft (1070m.). Before packing up, we used the anemometer to measure and record the wind speed and weather vane to record wind direction. It was noticed that the wind speed had dropped significantly by this time. Based on this observation, it is advisable in the future to record the wind speed just prior to launch. 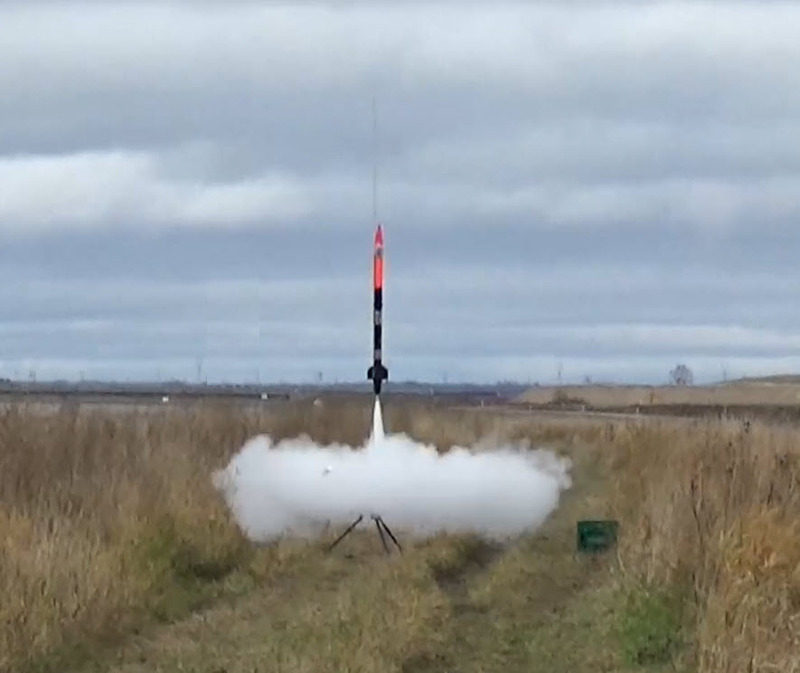 Post-flight examination confirmed that the rocket was in great shape. 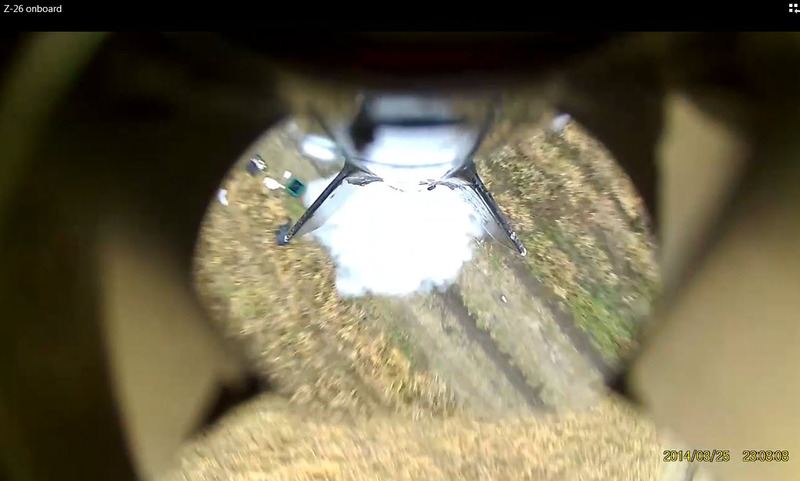 Excellent on-board HD video was obtained. The peak altitude of 3511 ft. correlates exactly to the peak altitude of 3606 ft. for Flight Z-25, taking into account the greater air density due to lower launch temperature (4°C. versus 26°C.). The smoke charge did not ignite, although the igniter did fire. Post-flight examination of the charge revealed that the igniter, which was different than usual, had a design flaw that directed heat of the burning pyrolant away from the charge surface. This will be rectified for the next flight.